Not bad at all for simply connecting but as you see, even connecting to torguard brings issues if your ISP is spying on you. 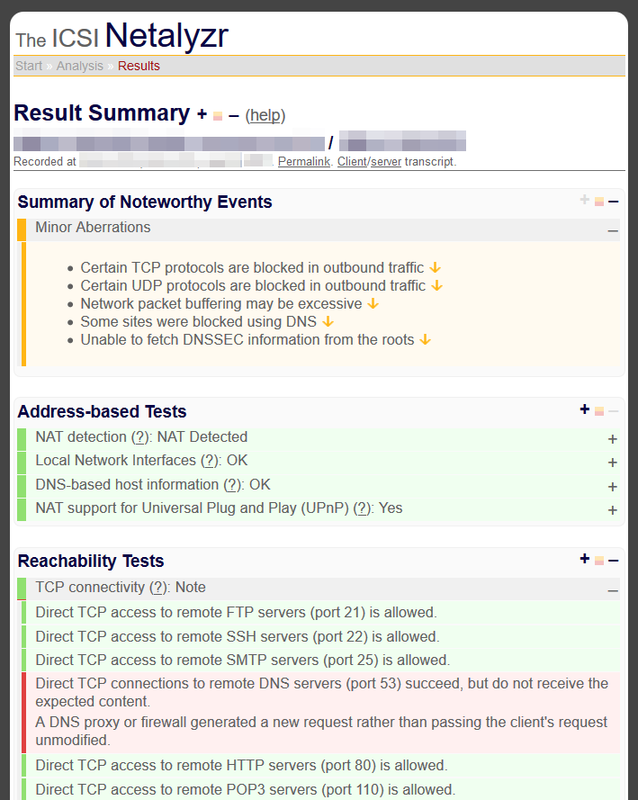 This is very good example of something, where other tests show you that everyhing is ok but this test clearly shows you that your ISP is hijacking DNS. Good article in german explaining it a little bit and includes the test itself. Direct TCP access to remote FTP servers (port 21) is allowed. Direct TCP access to remote SSH servers (port 22) is allowed. Direct TCP access to remote SMTP servers (port 25) is allowed. Direct TCP connections to remote DNS servers (port 53) succeed, but do not receive the expected content. A DNS proxy or firewall generated a new request rather than passing the client's request unmodified. Direct TCP access to remote HTTP servers (port 80) is allowed. Direct TCP access to remote POP3 servers (port 110) is allowed. Direct TCP access to remote RPC servers (port 135) is allowed. Direct TCP access to remote NetBIOS servers (port 139) is allowed. Direct TCP access to remote IMAP servers (port 143) is allowed. Direct TCP access to remote SNMP servers (port 161) is allowed. Direct TCP access to remote HTTPS servers (port 443) is allowed. Direct TCP access to remote SMB servers (port 445) is allowed. Direct TCP access to remote SMTP/SSL servers (port 465) is allowed. Direct TCP access to remote secure IMAP servers (port 585) is allowed. Direct TCP access to remote authenticated SMTP servers (port 587) is allowed. Direct TCP access to remote IMAP/SSL servers (port 993) is allowed. Direct TCP access to remote POP/SSL servers (port 995) is allowed. Direct TCP access to remote OpenVPN servers (port 1194) is allowed. Direct TCP access to remote PPTP Control servers (port 1723) is allowed. Direct TCP access to remote SIP servers (port 5060) is allowed. Direct TCP access to remote BitTorrent servers (port 6881) is allowed. Direct TCP access to remote TOR servers (port 9001) is allowed. Basic UDP access is available. The client was able to send fragmented UDP traffic. The client was able to receive fragmented UDP traffic. UDP access to remote DNS servers (port 53) appears to pass through a firewall or proxy. The client was unable to transmit a non-DNS traffic on this UDP port, but was able to transmit a legitimate DNS request, suggesting that a proxy, NAT, or firewall intercepted and blocked the deliberately invalid request. Direct UDP access to remote NTP servers (port 123) is allowed. Direct UDP access to remote NetBIOS NS servers (port 137) is allowed. Direct UDP access to remote NetBIOS DGM servers (port 138) is allowed. Direct UDP access to remote IKE key exchange servers (port 500) is allowed. Direct UDP access to remote OpenVPN servers (port 1194) is allowed. Direct UDP access to remote Slammer servers (port 1434) is allowed. Direct UDP access to remote L2 tunneling servers (port 1701) is allowed. Direct UDP access to remote IPSec NAT servers (port 4500) is blocked. Direct UDP access to remote RTP servers (port 5004) is allowed. Direct UDP access to remote RTCP servers (port 5005) is allowed. Direct UDP access to remote SIP servers (port 5060) is allowed. Direct UDP access to remote VoIP servers (port 7078) is allowed. Direct UDP access to remote VoIP servers (port 7082) is allowed. Direct UDP access to remote SCTP servers (port 9899) is allowed. Direct UDP access to remote Steam gaming servers (port 27005) is allowed. Direct UDP access to remote Steam gaming servers (port 27015) is allowed. We estimate your uplink as having 2300 ms of buffering. This is quite high, and you may experience substantial disruption to your network performance when performing interactive tasks such as web-surfing while simultaneously conducting large uploads. With such a buffer, real-time applications such as games or audio chat can work quite poorly when conducting large uploads at the same time. We estimate your downlink as having 800 ms of buffering. This level can in some situations prove somewhat high, and you may experience degraded performance when performing interactive tasks such as web-surfing while simultaneously conducting large downloads. Real-time applications, such as games or audio chat, may also work poorly when conducting large downloads at the same time. 3 popular names have a moderate anomaly: we are unable to find a reverse name associated with the IP address provided by your ISP's DNS server, although we expected to find a name. This is most likely due to a slow responding DNS server. If you rerun Netalyzr and see this condition remain, it could be due to a misconfiguration on the part of the domain owner, deliberate blocking using DNS, or your DNS server could be misconfigured or enabling a Man-in-the-Middle attack. 100 of 100 popular names were resolved successfully. Show all names. 2 popular names have a moderate anomaly. The returned IP address suggests that the name lookup was blocked using DNS. Instead of returing the proper IP address for the name, the IP address of your own system was returned instead, effectively blocking access to the site. 36 popular names have a mild anomaly. The ownership suggested by the reverse name lookup does not match our understanding of the original name. The most likely cause is the site's use of a Content Delivery Network. Show all names. 32 popular names have a mild anomaly: we are unable to find a reverse name associated with the IP address provided by your ISP's DNS server. This is most likely due to a slow responding DNS server or misconfiguration on the part of the domain owner. Show all names. No DNS root server instance would provide DNSSEC information. Because of this, your system cannot validate signatures for DNS replies, meaning you can't benefit from DNSSEC's protections.